been working up to the swap for over a year. stripped 2 pars cars, ordered fancy electronics and craigslist parts collected. been taking my time but I hope to have it done by march. I've done a few swaps over the years, this one has a fair bit of challenge to it for me. today I hope to get the 3800 into the asstek, id upload some pics but it looks like I have to link to pics here? Dude that sounds amazing! I'd love to see some pics. I believe you have to link them, try imgur. ill figure out the pics. New to the forum. Question? How are you going to get around the security features built into the PCM? Are you going to re-flash the Aztek's PCm with the 3800 S/C info? Or be flashing the 3800's PCM with the Aztek's codes to match the BCM identifiers? Also. are you using the Aztek's original trans or using the 3800 HD trans? Just wondering because I'm wanting to do this to my 03 Aztek. Wow, it looks to fit right in..
Also <3 the license plate!! She hopes to have it done by May. Sweet! I really need to know a bunch about this build. 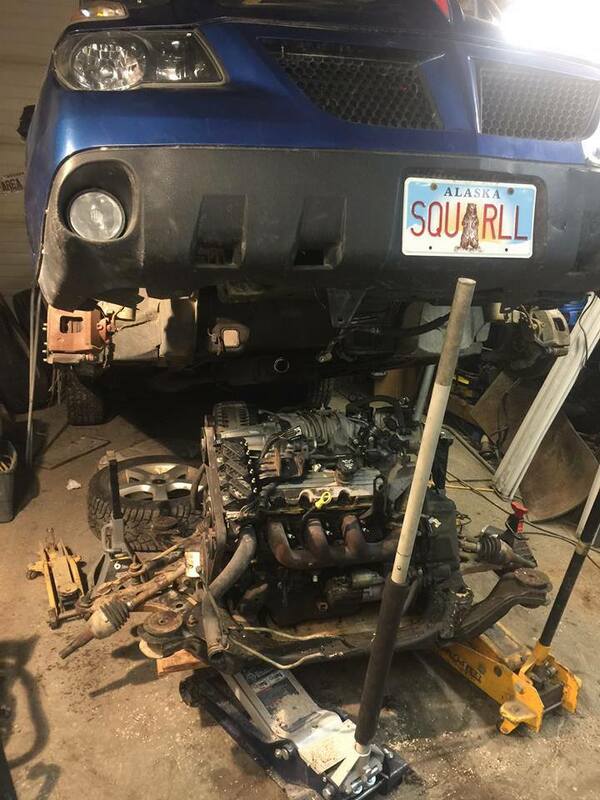 I'll be hopefully closing soon on a 2003 aztek with a blown engine and doing this swap! Already got most of the parts lined up. So I'm curious as to how it's working out for completed vehicles with this mod. How big are the gains in acceleration, top speed, etc. versus the losses in fuel mileage and reliability? Does the rest of the car (body computer, vehicle dynamics, all wheel drive if applicable) play nice with this bigger power plant? Good question! 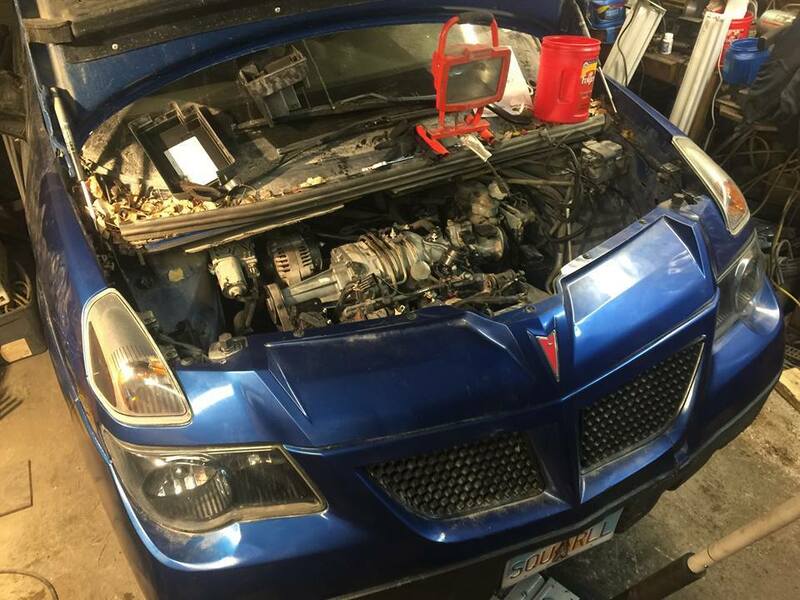 The 3400 in the aztek produces 185hp at 5200 rpm and 210 ft/lb of torque at 4000 rpm whereas the L32 supercharged makes 260hp at 5200rpm and 230 ft/lb at 4000 rpm (but doesn't peak there, it goes to 380 ft/lb at 5200 rpm). While this doesn't sound like that much, the biggest difference comes not at stock, but in performance applications. There's no argument that the 3800 dominates the 3400 in the availability and amount of options for performance upgrades. Even stock the torque is nearly double, but when you figure for a few hundred worth of mods, a gp can easily make as much as 500 hp and still be reliable. As far as reliability, the only real issue for both the 3400 and the 3800 were the lower intake manifold gaskets. The 3800 n/a had the plastic plenum egr issue, and both had the plastic coolant elbow issue, but all these items are pretty easy and cheap to fix. Both of them can last into 300,000 if properly maintained. Definitely no "loss" in reliability. As far as fuel economy is concerned, I can't comment with any real data yet on the aztek, but for the grand prix's the 3.1l (almost the same as the 3400) got 20 city and 30 highway where the 3800 got 18 city 28 highway, though admitedly, I get 20 city 32 highway in my gp. The biggest factor in gas comes with the fact the supercharged requires 91 octane to run correctly wheras the 3400 doesn't, but it really doesn't cost that much more per fillup. It also depends on wether you have a "lead foot". So while the 3400 is slightly better on gas, its not as big of a "loss" as you'd expect from gaining all that torque. While I can't say for sure until I do the swap, the drivability shouldn't decrease with the 3800 as the suspension is literally identical between the two. The only reason the AWD wouldn't work is because there has never been a stock supercharged versitrack vehicle and as of right now, there's no way to "morph" the 3800 engine tune in place of the 3400, it's all or nothing. The transmissions are identical with the exception of the gear ratio which can be tuned for. The big issue is that you definitely can't use the gp tune since the gp used manual pcm gauges instead of class 2 data, so a regal or impala would be a better candidate, though the only difference between the equipment is the software, so if you have a flasher, it doesn't matter which harness you grab as you'll have to modify it regardless. The only way you could possibly get AWD is if you ran dual pcms and used the Aztek one to control the transmission and maybe a few other things and the supercharged pcm tune to control the engine and everything else. Admittedly that would be a wiring and logistical nightmare. Basically it comes down to what your priorities, goals, and budget is. 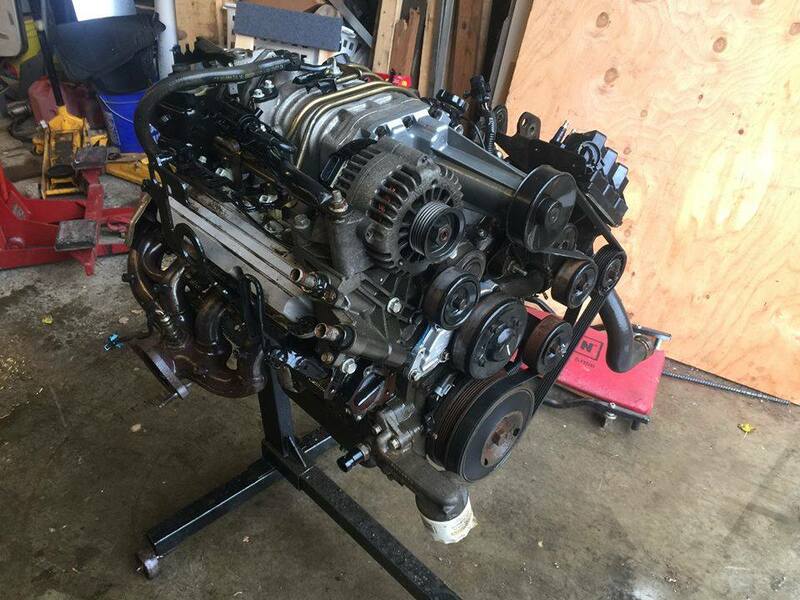 If you're simply looking for a stock engine replacement and don't plan on using it to tow or do and mods or performance oriented things, absolutely choose the 3400. If you already have a good 3400 and don't intend on doing any performance things, I'd leave it. If your engine is blown (like the one I'm about to buy) and isn't rebuild-able and it costs the same for both engines to get from the junkyard and you have some extra time on your hands and enjoy doing that kind of stuff, it only makes sense. No, I wouldn't recommend it to anyone who hasn't done a lot of work on cars or someone who would be paying someone else to do it, as it probably isn't worth the time frustration or money to you. That being said, I have no doubt that it will make the driving experience much more exciting, and whenever a stock v6 mustang who thinks they're the sh*t badmouths my aztek, I'll be able to easily stomp them, which trust me, is priceless. "That being said, I have no doubt that it will make the driving experience much more exciting, and whenever a stock v6 mustang who thinks they're the sh*t badmouths my aztek, I'll be able to easily stomp them, which trust me, is priceless." Anyhow it now starts and runs in the asstek with the buick ECM, with the key...lol. its on a blended harness with 1 ecm.